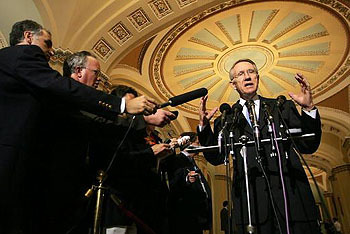 The Senate reconciliation vote occurred on May 23, 2003. In the month of May, only one New York Times article so much as mentioned the use of reconciliation for the tax cuts….And that’s more attention than most news outlets gave to the use of reconciliation that month. The Washington Post didn’t run a single article, column, editorial, or letter to the editor that used the words “reconciliation” and “senate.” Not one. USA Today, the Los Angeles Times, and the Associated Press were similarly silent. noticed it, even when Republicans made noises about firing the parliamentarian they elevated when they fired the previous parliamentarian. Point taken. In fairness, though, part of the problem here is the Democrats didn’t complain about reconciliation back in 2003. There’s no reason for the media to make a fuss if the opposition party hasn’t bothered to bring it up, after all. This doesn’t excuse the fact that they keep getting basic facts wrong this time around, like the fact that Dems aren’t planning to pass the entire healthcare package through reconciliation, only a small package of amendments. And it doesn’t change the fact that the conservative noise machine is way more effective than anything liberals have. Even if congressional Democrats had tried to make an issue out of reconciliation in 2003, they probably wouldn’t have gotten much traction.